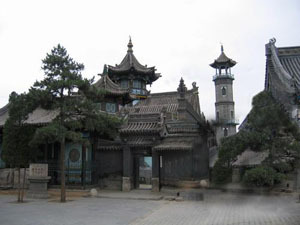 The Great Mosque (qīng zhēn dà sì 清真大寺), located in the older southwestern part of Hohhot, was built during the reign of Emperor Kangxi (kāng xī 康熙) of the Qing Dynasty (qīng cháo 清朝) (1644-1911 AD) after throngs of the Hui (huí 回) Muslim Minority migrated from Xinjiang (xīn jiāng 新疆) to Mongolia. The Great Mosque is the earliest and largest mosque among those eight mosques in Hohhot, the capital city Inner Mongolia Autonomous Region. Great Mosque was built in 1693; renovated in 1789 and 1923. It now covers an area of 4000 square meters. Islam was introduced into Inner Mongolia during the Yuan Dynasty (yuán cháo 元朝) (1279-1368). Towards the end of Ming Dynasty (míng cháo 明朝) and beginning of Qing Dynasty, Koran education became widespread in Inner Mongolia and many mosques were built in Inner Mongolia. Currently there are 210,000 Muslims in Inner Mongolia and most of them are Hui Muslims. There are over 1000 Mongolians living in Alashanqi who are Muslims as well. There are 177 mosques in Inner Mongolia: 17 mosques in Hohhot (hū hé hào tè 呼和浩特); 12 mosques in Baotou (bāo tóu 包头); 12 mosques in Wuhai (wū hǎi 乌海); 26 mosques in Chifeng (chì fēng 赤峰); 11 mosques in Tongliao (tōng liáo 通辽), etc. The mosque is a strange mix of Chinese and Arabic architecture. Chinese mosques during the Qing Dynasty had minarets that were a compromise between a pure Islamic minaret and a Chinese pagoda, i.e., they were minarets that were crowned with a pavilion-type roof. Moreover, Chinese mosques of that period had steles, or plaques, which reminded Muslim worshippers of their inescapable loyalty to the emperor. 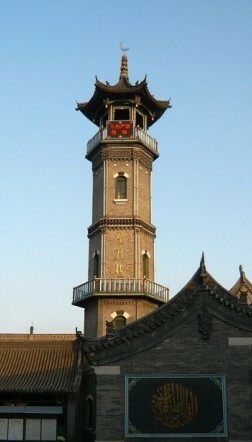 The Great Mosque of Hohhot has only a single minaret, which, incidentally, was not part of the original design, but was added on later. The back exit leads through a small street lined with food stalls on one side and tables and chairs on the other. Here you'll find Muslim snacks such as noodles and kabobs. To get back to Tongdao Jie, walk the full length of the lane. Opening Hours: 8:30 a.m.-6:00 p.m. Address: The Great Mosque is situated to the north of the Xilitu Zhao (xí lì tú zhào 席力图召) on Tongdao Street (tōng dào jiē 通道街), near the intersection with the southern end of Zhongshan Road (zhōng shān lù 中山路). How to Get there: The best way to get here is to walk if you are anywhere near, southwards along Zhongshan Road and it is on our right at the end of this road. From the southern temples, Dazhao and Xilituzhao, you need to head north along Danan Street (dà nán jiē 大南街), onto Tongdao Street. 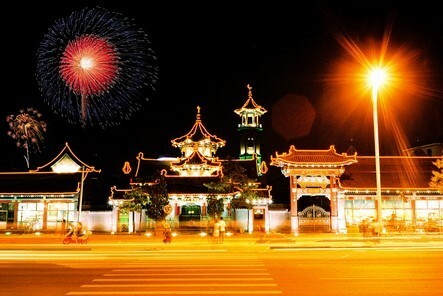 A taxi should get you here from almost anywhere in town for less the CNY 15. Or take bus No. 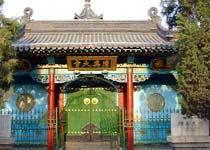 6/13/15/21/24/25/50/58/59/61/67/302 and get off at the "huizhong” stop (huí zhōng zhàn 回中站) or “the north door of old city of Hohhot” stop (jiù chéng běi mén zhàn 旧城北门站).